The AC Clamp Tester F07 is able to measure alternating and direct current. Voltages up to 600 V can also be determined by using the AC Clamp Tester F07. Another feature of the AC clamp tester is the measurement of inrush currents. 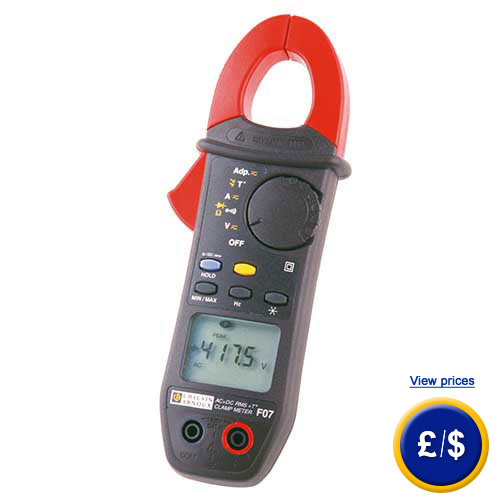 Beside these functions, the AC Clamp Tester F07 is capable of diagnosing frequencies up to 20 kHz. In addition, the AC clamp tester features other multimeter functions like electrical resistance measuring, continuity testing, diode testing, etc. You can also connect external measuring adapters to the AC clamp tester in order to determine other physical values. The AC clamp tester can measure the internal and external temperature too. For enhancing the durability of the battery, the AC clamp tester comes with an automatic shutdown function. If you have any questions about this AC Clamp Tester F07, see the technical specifications below or contact us: UK customers +44(0) 23 809 870 30 / US customers +1-410-387-7703. Our technicians and engineers will gladly advise you on all clamp meters and all products in the field of measuring instruments, regulation and control and scales.